When I was at the store buying fruit and vegetables I saw some beautiful blood oranges, I love them, juiced, in baked goods or straight up. After using all but 2 I wondered what I could do with the last of my oranges. Simple syrup is something I always keep in the refrigerator, I use it for baking, drinks or spoon on fruit salad. It’s a staple item for me. 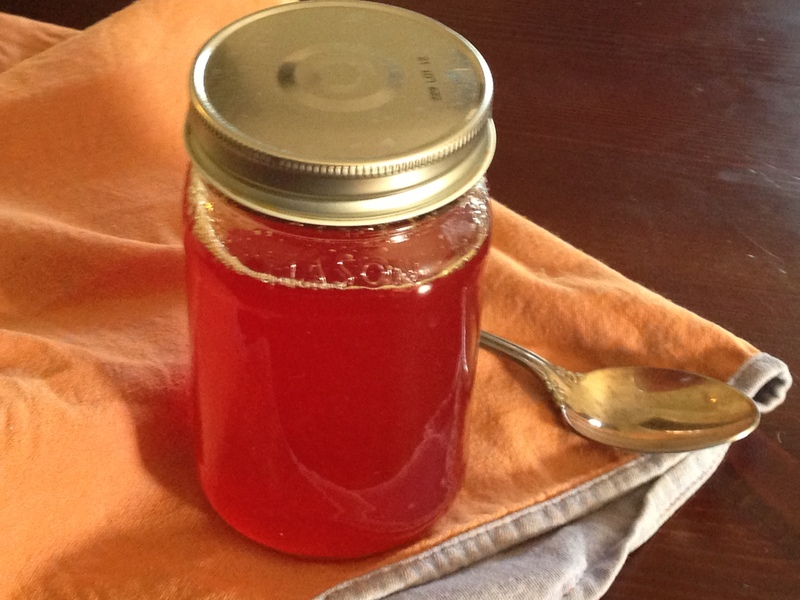 The blood oranges made a beautiful and delicious syrup, a gorgeous color, and that unmistakable blood orange flavor. It’s so simple to make, taking only a few minutes. I’m saving some of it for the Semolina Olive Oil Cake, I think it would make a delicious soaking syrup. Mix it in sparkling water to make soda, you control the sweetness, it’s great in mixed drinks, Sangria, there are so many possibilities. Place everything in a medium size saucepan, bring to a boil on high heat, when there is a rolling boil, reduce to medium/high and cook on a low boil uncovered for 10-15 minutes. The syrup will reduce a little, for a thicker syrup you would have to boil longer, 20-25 minutes. Remove from heat, let cool and pour into a lidded jar. Refrigerate. ← Pairing Desserts and Wine- Part 3 How And Why! Thank you Tracey, I was lucky to find some, the season for them is ending and when I saw them I grabbed as many as I could. They are wonderful and the last two that I used to make the syrup were starting to look a little sad so I figured I should use them right away. The syrup is very intense and I love it. I love simple syrups, flavored with all sorts of fruits and herbs. One of my favorites is made with lime and lemongrass! Thank you so much. Thanks Julia, I went to the market this morning and they were all gone. Going to try one more shop tomorrow. I love them and preserving the taste in the syrup is great and it keeps forever in the fridge. I usually pour it warm into mason jars and the heat forms a seal so I do several jars at a time. Alas, I only had two oranges today. I found a TON of blood oranges at my local grocery store tonight! Woohoo! I’m going to attempt a basil/blood orange caipirinha by the weekend. I will report back asap! Oh wow are you lucky, I want one now. Please let me know how it is, sound so good!!! I just picked up some blood oranges a couple of days ago, and was wondering what I might do with them. This is a wonderful idea, and yes I can just see it on your Semolina Olive Oil Cake! Blood oranges can be tricky here, at least finding good ones. The oranges I got were perfect I was so excited. Thanks so much Susan. Love these type of recipes. As much as I like blood oranges (a LOT) I have none but I do have some grapefruits. I’m pretty sure I can follow your recipe and sub them instead, right? Also do you have a recipe for orange peel candy? If so, would you pretty please post it? Thank you, yes grapefruit would be wonderful as a simple syrup, I would add some mint or rosemary, I love mint and grapefruit. Yes I have made candied orange peel. I have never written down the recipe but it’s as simple as taking your orange peel and boiling in the simple syrup until soft and then letting it dry. I will send you the recipe. Oooh, nice, thank you, can’t wait to get your recipe. I may even attempt to dip it in chocolate, but first things first. You and your sweet tooth always come up with great recipes! I have question on a different matter. What is your opinion about grape-wine marmalade. Have you ever made it? I’ve been offered to publish a guest post about grape-wine marmelade but I can’t really imagine how it tastes and if it’s any good. Hi Julian; Thank you, my sweet tooth always prevails. LOL! Yes, I have had grape wine jam. As a matter of fact I was sent a jar by an Italian company Felido Delle Ginestre, its a jam made from Montepulciano grapes and wine. It’s good, very rich and quite complex. The wine is somewhat detectable but because the grapes are cooked in it they meld and it’s difficult to discern the flavor of the grapes from the wine. I like it, and have thought about making it myself, the flavor and texture is quite different from a traditional jam. Honestly, I prefer to drink my wine and make jam the traditional way but it’s good for something a bit different. Thanks a lot for your input on grape-wine marmalade. I also prefer to drink my and to eat traditional jam. Suzanne, ths color is so beautiful. Would you believe I’ve never ad a blood orange? How do they differ from regular oranges in taste? The syrup is such a creative idea. Thanks Brandi, it’s difficult to describe, they do taste like an orange but more complex, there is a note of cherry and the color is spectacular. If you can find them you really should give them a try. They are definitely worth seeking out. Thank you, thats what I like to do, dip the spoon in the syrup. It’s very intense in flavor. They are wonderful and make a great syrup among many other uses. It’s fabulous in drinks and love it with club soda! Thanks Suzie, hope you are well! This looks delicious and I can only imagine it on the semolina cake! It will be an incredible taste together! I think it would be really good on the semolina cake, the flavor would be great. Thanks so much. It’s so pretty I just keep looking at it instead of using it and you never know when you will find good blood oranges again. You are correct, when you find these wonderfully delicious foods, you have to purchase them quickly. They don’t seem to last. Excellent idea! I am going to look for more and juice them and freeze in ice cube trays so I have fresh blood orange juice. It seems like the best foods have such a short life on the shelves. I adore blood oranges as well! The color is absolutely divine! Beautiful! Thank you so much! It is beautiful and I love blood oranges. Mmm this sounds delicious! The color looks great too! Isn’t the color beautiful, I really love blood oranges. Thank you so much. Truly a gorgeous color, Suzanne, and I know the flavor is bright and wonderful. We’ve been devouring blood oranges (and sumo oranges – have you seen them?) and making a syrup is a marvelous idea. I like making syrups for soda water, so I’ll have to make a batch soon. Yes, as a mater of fact I just devoured several sumo oranges yesterday. They are so delicious and just tasted them for the first time. They are almost silky in texture and sweet. So wonderful. Thank you. This looks absolutely wonderful to put on cake as you had suggested or even pancakes! I would love to have that cake recipe too if you have it! This is a fabulous idea, and just last week a friend/fellow food-blogger posted a question to ask what she could do with a plethora of blood oranges! Yep, I’m sending this to her now! 🙂 Thanks, Suzanne! Thanks Christina, I love it. It’s nice to have a plethora of those delciious oranges. Stunning color! I would love to try it in sangria! Thank you, I plan on it. I just found more blood oranges and am going to make another batch and freeze some of the juice. It’s so versatile. This looks wonderful! I love having a simple syrup on hand as well…it is so versatile and a quick fix for so many things. I adds the “little something.” Thank you for sharing your recipe. Thank you so much, it does add “a little something special” to so many different recipes. Just used it to slightly sweeten a fruit salad, it’s delicious! What a great jar of yummy to have in your cupboard! Thank you, I can’t wait until spring and summer, I make all different syrups with berries, fruit and herbs. They are so good to have around. This is so clever! I have a few blood oranges in my fridge I’ve been wanting to use for something special. Thank you Tina, it’s wonderful. I just found some fresh figs at the market, go figure didn’t even know they were in season. I guess they are somewhere so I snatched a few containers and preserved them in the blood orange syrup. It’s fantastic and has so many uses. Made a drink the other night with real ginger ale, campari and blood orange syrup. I hope you give it a try it’s wonderful. Omg. I will. That sounds very similar to a drink they serve in my favorite restaurant that I’m addicted to 🙂 thanks! Thanks Tina, I hope you enjoy, I hope I can find some more blood oranges, they are past season but there may be some strays out there somewhere, Have a great weekend.